The freedom of RV living and traveling just got freer, and greener. You’ll never have to stop for gas again in this all-electric pop-up camper van. Although the drive-range is somewhat short for a vehicle intended for long road trips, if you’re not in a rush, Nissan’s new all-electric camper van is an ideal way to travel. For many looking to see the world, or live a minimalist life on the road, the expense and pollution of keeping their gas-guzzling motor homes fueled up is prohibitive. But imagine if you never had to put gas in those hogs again. With a drive range of 124 miles, you could take your time traveling the country with zero gas costs and zero emissions. Sure you’d have to stop and charge every two hours, but you could stop at a charging station at Whole Foods for lunch and then hook up at any campground that offers power overnight. 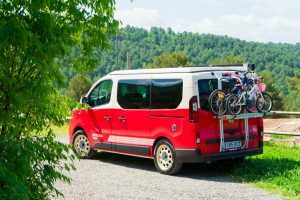 It’s currently only available in Spain, but as the technology improves and drive-ranges increase, electric camper vans could soon become part of a new American dream. Nissan is not the first company to begin working on an electric RV, but it’s the first to make the concept viable. 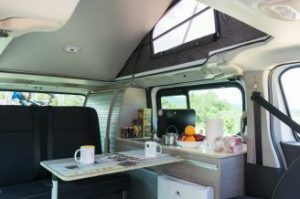 A German company recently unveiled a full-size electric motorhome prototype and Winnebago launched an all-electric RV platform. But neither currently have a good enough powertrain to make those vehicles practical for long distance travel. 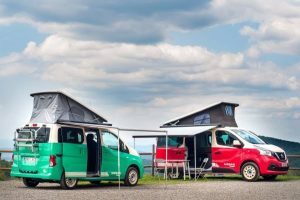 Tesla fans are dreaming about an electric motor home based on Tesla Semi, but Nissan has now made the dream a reality with a modified version of their e-NV200. Volkswagon plans to have an electric VW bus on the market by 2022. Depending on its success in Spain, Nissan will expand its electric camper van to other countries.